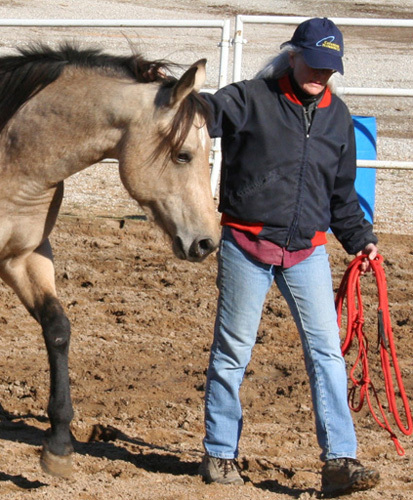 Working with the horses and my clients lately has gotten me wondering about just what “leadership” really means. There are so many “leadership styles,” so much “leadership training” out there that it boggles the mind! In my work, I’m just going to have to let the horses tell me what it means and how to practice it. This, clearly, will be an ongoing topic in my life and on this blog! A leader doesn’t make a big fuss over it. A leader’s energy is calm, grounded, and steady. When necessary, the leader’s energy escalates as much as necessary, but just enough to get the job done, and then quiets back down. A leader doesn’t shout—doesn’t need to. Because there’s no shouting and no drama, her followers listen and pay attention. A leader is respectful in her requests, but expects to be listened to. She promises that she will ask, suggest, urge, and then follow through with sufficient energy to get the job done. This is part of the “contract” she has with her followers. A leader rewards for the slightest effort and smallest try, so that her followers know their efforts are noticed and appreciated. A leader listens to her followers. They are entitled to an opinion and to be heard respectfully. However, the leader makes the decisions. A leader understands how to communicate effectively, with voice, energy, and body language, so that there is no misunderstanding. These are just a few of the things that come to mind. The horses are great at teaching these principles, and they keep me on my toes as I learn, too. ← Welcome to the new Alchemical Horse!